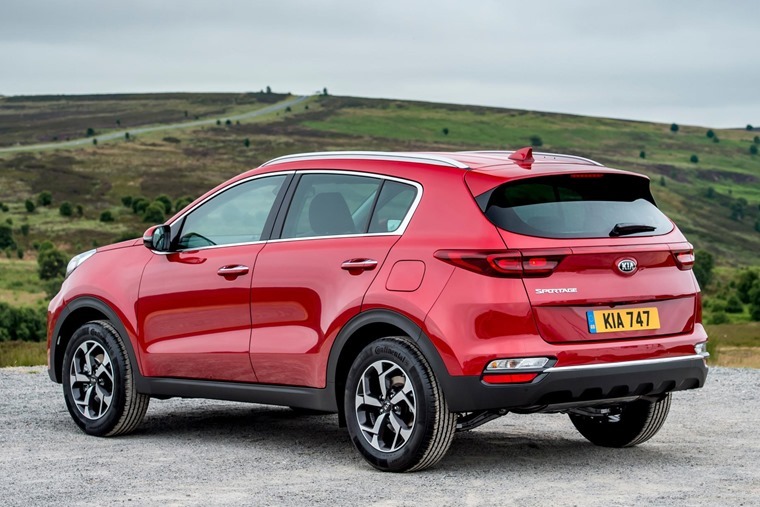 With an updated exterior and interior design, new safety and infotainment technologies, and a revised powertrain line-up including a 2.0-litre diesel mild-hybrid, the new Kia Sportage will be available towards the end of 2018 priced from £20,305. The Sportage’s advanced new EcoDynamic+ 48V diesel mild-hybrid powertrain will be the first to be launched as part of the brand’s global powertrain electrification strategy. 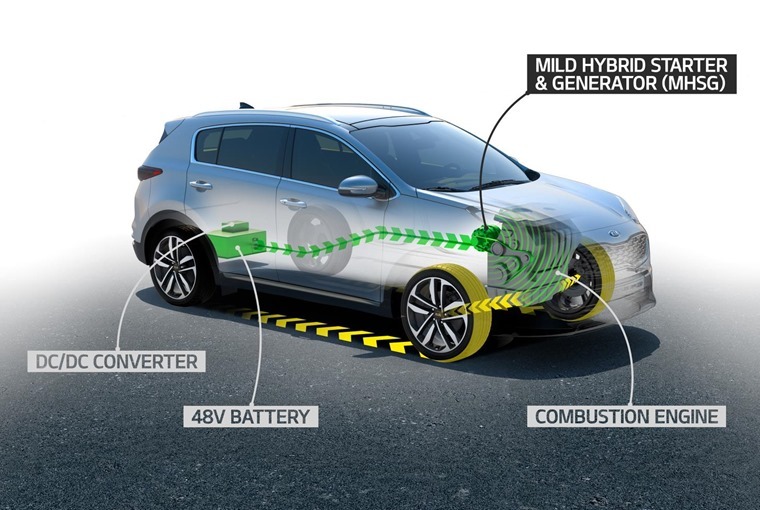 With this in mind, Kia will be the first manufacturer to offer hybrid, plug-in hybrid, battery-electric and 48-volt mild-hybrid technology across its full model line-up. The new ‘EcoDynamics+’ drivetrain makes use of a 0.46kWh 48V lithium-ion battery, which is used to power a start-generator unit. This is connected to the crankshaft via a drive belt, and can provide the diesel engine with an extra 10kW (around 8bhp) of power. This should result in up to a 4% reduction in C02 emissions (WLTP) when used with a manual gearbox. On top of the mild-hybrid powertrain, a 1.6-litre ‘U3’ diesel engine will also be available which replaces the outgoing models 1.7 litre CRDi engine. The new 1.6-litre diesel engine produces 114 or 134bhp, with emissions rated from 130g/km for 114bhp models, and 126g/km for higher-powered models. The line-up of petrol engines remains the same in the upgraded Sportage, though with minor modifications to emissions. The naturally-aspirated 130bhp 1.6-litre GDi engine offers a torque output of 161Nm, and CO2 emissions from 162g/km while the T-GDi engine develops 174bhp at 5,500rpm with fuel economy up to 39.2mpg. Spotlight on the Sportage; Has Kia got the crossover nailed? 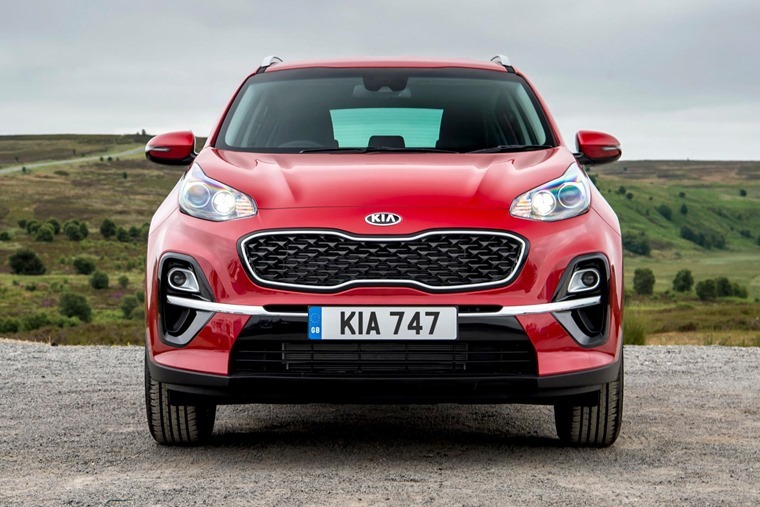 Moving slightly away from the crossover look, the Sportage features a more sporty exterior design with improvements including new front and rear bumpers and new 16in, 17in and 19in alloy wheel designs. Options include chrome sill trim and metallic skid plates, and five new paint colours. 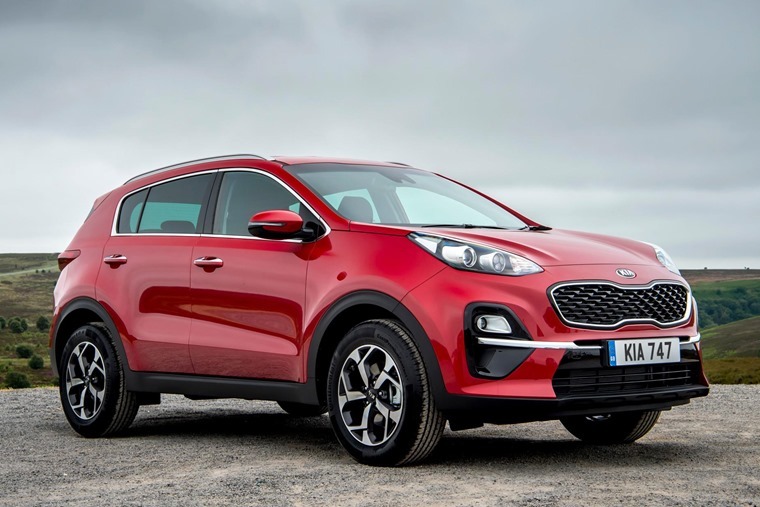 The new Sportage also benefits from Kia’s latest advanced driving assistance systems, including Smart Cruise Control with Stop&Go, an Around View Monitor for easier parking manoeuvres, and Driver Attention Warning, to combat fatigue and inattentiveness at the wheel. As far as infotainment, depending on grade there is either a 7in touchscreen or a new ‘frameless’ 8in system, each with DAB digital radio. 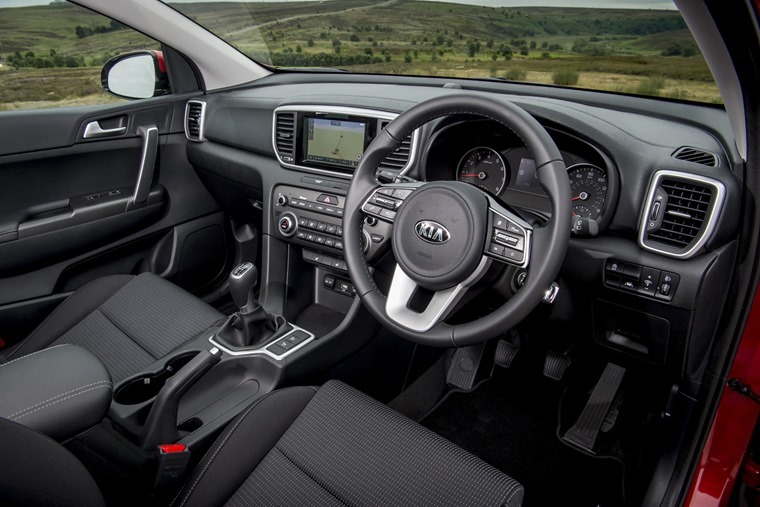 All satellite navigation systems (Grade ‘2’ and above) include Kia’s Connected Services powered by TomTom as standard. Entry-level '1' cars get 16in alloys, LED daytime running lights, all-round electric windows, air-con, DAB radio and USB connectivity. Every car gets a reversing camera, and the specification is enhanced by the standard-fit Apple CarPlay and Android Auto set-up. Safety kit includes Trailer Stability Assist, Hill-Start Assist Control, Downhill Brake Control and cruise control. Prices start from £20,305 for the 1.6 GDi petrol, while the diesel costs from £21,595. Priced from £22,405, '2' specification comes with 17in wheels, body coloured trim, a seven-inch touchscreen sat-nav, privacy glass and electrically-folding door mirrors. You also get heated front seats, dual-zone climate control and automatic wipers as well as Lane-Keep Assist, High-Beam Assist, and a Speed Limit Information. Skipping over a ‘3’ trim for some reason, the '4' spec includes the frameless eight-inch screen, panoramic roof, electric leather seats and keyless go. Prices starts from £27,260, with all cars benefitting from a 360-degree around view monitor and a JBL sound system as well as black wheel arch and body mouldings, LED lights, silver skid plates and 19-inch wheels. Forward Collision-Avoidance Assist with pedestrian detection is standard. At the top of the range, Kia is continuing its tradition of sportier GT-Line (from £25,510) and GT-Line S cars. These gain exclusive wheels, front parking sensors, LED front fog lights and a flat-bottom steering wheels, while GT-Line S cars (from £31,645) get ventilated seats, a heated steering wheel and wireless phone charging. A regular top ten enquiry on ContractHireAndLeasing.com, the Sportage continues to be the brand’s biggest seller with 39,683 delivered to customers in 2017, making up over a third of UK sales last year.